One role of the pelvic floor muscles is to keep stool, gas and urine in until you choose to pass them. When stool, gas or urine escapes involuntarily (or when you do not consciously choose to pass them) this is called incontinence. It is common for the occurrence of incontinence to increase during pregnancy, after vaginal delivery, around menopause and with ageing, but should not be accepted as normal. Some males experience stress urinary incontinence following radical prostatectomy for prostate cancer. This type of incontinence occurs when the pressure within the abdominal cavity exceeds the closure pressure of the pelvic floor muscles. Actions that increase pressure within the abdominal cavity include coughing, laughing, sneezing, walking, running, jumping, lifting, carrying, squatting, rising from sitting, bending over, etc. The bladder’s job is to fill with and store urine. It is supposed to signal us calmly when it has a good volume of urine stored within it. If we are occupied and don’t want to use the toilet immediately, or if the bathroom is busy, we should have the ability to put off the urge to go to the toilet. Unfortunately, the bladder can misbehave in it’s signaling. Instead of signaling calmly that it is full, it over-reacts in a spastic way – this is called bladder urgency or overactive bladder. 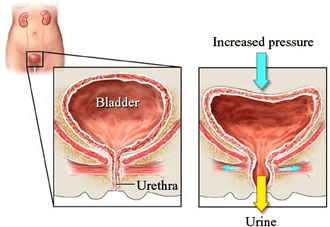 If this spasm causes pressure within the bladder that is stronger than the closure pressure of the pelvic floor muscles, then there will be urine leakage (called urgency related urinary incontinence or “wet” overactive bladder). The bladder can also send an early signal when it isn’t very full (called bladder frequency or “dry” overactive bladder). Both bladder urgency and frequency can occur together. For example, a person can experience an abnormally strong, sudden and compelling urge to urinate, and while rushing to the toilet may leak urine on the way. On top of that, once in the bathroom passes only a small amount of urine (say, ½ cup or less). The good news is that bladder and bowel incontinence can be managed and often cured with conservative treatment including physiotherapy supervised* pelvic floor exercises and behavioral changes. 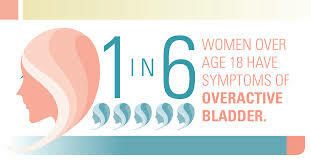 Treatment options include supervised pelvic floor muscle exercises confirmed with vaginal and/or rectal examination, Real-Time Ultrasound Imaging, and EMG biofeedback.